There’s nothing we enjoy more than seeing the creative and impressive things our users are doing with Scylla. 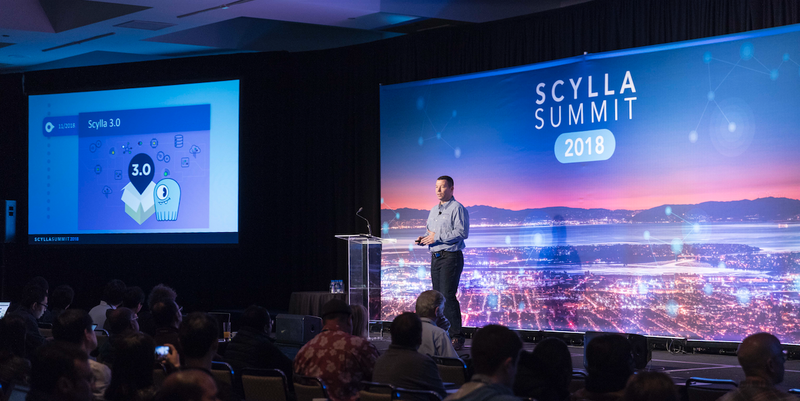 With that in mind, we presented our Scylla User Awards at last week’s Scylla Summit, where we brought the winners up on stage for a big round of applause and bestowed them with commemorative trophies. I’m glad to share the winners here, along with a few notes on their use of Scylla. Nauto makes our roads safer. The company’s devices are deployed to fleet vehicles to monitor driver performance and help reduce risky behaviors. Nauto uses Scylla to store a variety of data, including 128 dimensional feature space for facial recognition, geolocation, and routes. Nauto’s algorithms interpret this data to make real-time decisions and to intervene before aggressive driving becomes a problem. Grab is one of the most frequently used mobile platforms in Southeast Asia, enabling their customers to commute, eat, arrange shopping deliveries, and pay with one e-wallet. Grab relies on Scylla as an aggregation metadata store, handling peak loads of 40K operations per second. Comcast’s Xfinity X1 is a first-of-its-kind multi-screen, cloud-based entertainment platform that addresses the current and future challenges of the pay TV industry. With its use of Scylla, Comcast replaced both Apache Cassandra and Varnish Cache. GE Digital migrated to Scylla to help drive the world’s largest IOT platform. Their requirements were to absorb tens of billions of records per day, support millions of analytics transactions and maintain sub-second response times end-to-end. Child Rescue Coalition (CRC) uses Scylla to help protect children from abuse and to bring offenders to justice. As part of this mission, CRC leverages Scylla to aggregate multiple sources of data, which result in tens of billions of records. Using this data, CRC builds tools that enable law enforcement to more efficiently identify perpetrators and to rescue children from exploitation and abuse. CRC provides this critical technology to law enforcement organizations and investigators around the world at no charge. Sizmek is one of the world’s largest independent advertising platforms, processing 240 billion requests per day, each one in less than 70 milliseconds. Sizmek runs Scylla in 7 datacenters, achieving high throughput with very low and consistent latency for their global customers. Meshify’s IoT platform uses battery-powered wireless sensors to monitor industrial environmental environments. Using that data, Meshify is able to predict accidents, preventing them before they can happen. Meshify took advantage of Scylla’s pre-tuned AMIs to spin up a three-node cluster in 30 minutes. In disaster recovery scenarios, Scylla takes a mere 30 minutes to restore a new node. With 57 offices spread across 31 countries, Samsung SDS plays a pivotal role across the Samsung Group of companies by improving innovation and IT competitiveness. Samsung adopted Scylla for a range of use cases, including manufacturing, IoT platform, communication and healthcare systems. Numberly’s multi-platform, multi-device, multi-format solutions include real-time bidding, targeted display advertising, CRM program and an advanced data management platform. Numberly uses Scylla to support real-time data for low-latency, location-based services. Alexys Jacob-Monier is well known and appreciated by our engineering and solutions teams for his contributions to Scylla. Red Hat Ceph Storage is an open, massively scalable storage solution for modern workloads like cloud infrastructure, analytics, media repositories, and backup and restore systems. To achieve better performance and hardware utilization, Red Hat ported Ceph to the Seastar Framework, the foundation of the Scylla database. Along the way, the team contributed numerous valuable enhancements to the open source framework. Tobias Macey manages and leads the Technical Operations team at MIT Open Learning, where he designs and builds cloud infrastructure to power online access to education for the global MIT community. Demonstrating his commitment to evangelizing Scylla, Tobias’s podcast on Scylla has been downloaded by more than 1,600 listeners. The Veramine platform helps keep enterprises secure through reactive intrusion response and proactive threat detection. Veramine leverages Scylla to centralize data from sensors that collect and forward all security-relevant information from Windows-based hosts across an enterprise. With this award, we recognized the great work Jonathan Ness has done in helping improve our product. Please join us in congratulating our 2018 Scylla User Award winners! If you’ve got an innovative use of Scylla you’d like to share, please let us know. Perhaps your use case will be a 2019 Scylla User Award winner! Bob has 20+ years of technology marketing experience, including leadership roles at Digital Domain, Perforce and AmberPoint. He loves talking with customers, analysts and media about tech trends and use cases. Away from work he can be found backpacking and skiing the Sierras with his family, though he spends most weekends working on home improvement projects.